Each kit includes enough paint for the number of standard decoys as noted above plus an instruction sheet with a diagram of the duck to be painted. These paints have a dull matt finish to better duplicate the look of real ducks. Decoy size, shape & texture may vary, so adapt your technique accordingly. Prepare the decoy surface by sanding or cleaning to remove encrusted dirt, scale & loose paint. Patch or fill cracks, checks & shot pellet damage. Be sure the head is secure. 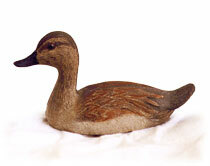 Styrofoam or blow up decoys can be primed with decoy paint body color. Other types of decoys should be primed with a universal primer. Primer must be thoroughly dry before applying top coat. 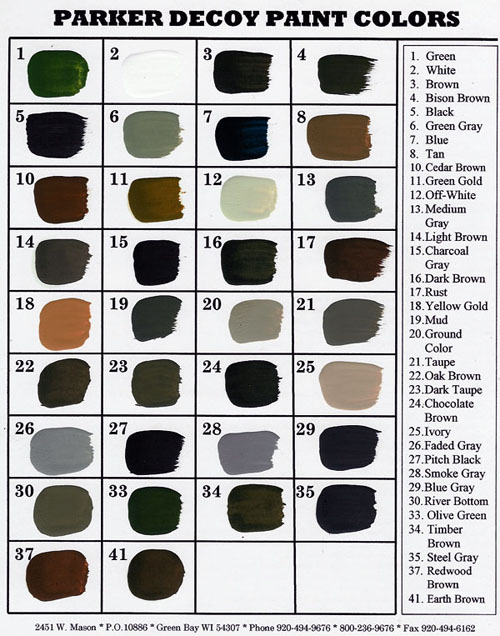 Deep or dark decoy colors may need multiple coats to ensure a solid tone. Allow each coat or color to dry before applying subsequent coats. Stir well before using. Do not thin if brushing--can be thinned to a maximum of 10% for spray or airbrush applications. If thinning use paint thinner or mineral spirits. Decoy paint may form a thin skin on top of paint, remove before stirring. To store Parker's decoy paint, place a small amount of paint thinner in container & secure lid tight & store paint upside down.